Gustavo Bonevardi, artist, on a picture of the now vanished Pier 48 in Manhattan. GILDED BIRDS Tell me why you chose this. GUSTAVO BONEVARDI It took me a long time to settle on something. I began to realize that just about anything can be beautiful, it’s about how you look at it. But after having been nearly overwhelmed with indecision this picture just felt right. Pier 48 was two blocks from where I grew up and it was a big part of my teenage years. It was a place I escaped to. The structure was condemned and the city was always putting up chain link fence or making some other futile attempt to stop anyone from getting in. No matter what they did, within days people would find new ways to sneak in. Once inside you really felt as though you’d been transported, removed from the city, removed from the reality of this world and into some sort of dreamland. I love ruins. I love the way man-made things surrender themselves to nature again. It’s like the completing of something, a resolution. It’s humbling to see. Every time I get a chance to visit archeological ruins, I go. There’s a part of me that should have been an archeologist. GILDED BIRDS The curves of this building are lovely. Do you think this building collapsed in a particularly beautiful way? GUSTAVO BONEVARDI I am an architect as well as an artist, and I do see the similarities between the curving forms of this ruin and contemporary architecture like Frank Gehry’s. It is very beautiful, but that’s not at all why I chose it. I also love the eroded quality of the huge beams and piles slowly crumbling into the river in the foreground of the photograph. GILDED BIRDS Do you think our cities would be more beautiful if we left a few more ruins gently crumbling back to their natural state? GUSTAVO BONEVARDI I would love that. I suppose it’s possible but it would be difficult. Part of the beauty of ruins is that they are actually fragile and ephemeral. This pier had reached a point where it was perfect in its state of collapse, but it was a moment, and it passed. It became increasingly more dangerous, caught fire and was finally demolished. There’s a lovely park there now and everyone seems to be very happy with that, but I miss my pier. GILDED BIRDS Was the danger part of the beauty? GUSTAVO BONEVARDI It always felt dangerous and sometimes it was. Not only were there holes in the floor but the ceiling was collapsing, and there were also the occasional sketchy figures lurking in the shadows. It was New York in the 1970s, a different place from what it is today. Danger has a way of heightening an experience, and this was so spectacular because you were completely surrounded by and immersed in the structure. The hollow acoustics and dappled lighting of the interior, the shape and scale of the place, it was a different world you inhabited. GILDED BIRDS And the fact that the piers started to play a role in gay culture in the 1970s is a separate issue for you? The beauty is all in the decay? GUSTAVO BONEVARDI I am gay so for sure, that played a part. At times there were people milling around looking to hook up, but they were just as likely there to do drugs or just escape. But in any case it was decidedly not social, there was little eye contact or even polite hellos or nods, everyone kept pretty much to themselves. The mystery and feeling of transgression, exploration and adventure were all part of the allure. In my experience it was a very solitary place. GILDED BIRDS Do you consider beauty when you make your art? BONEVARDI I guess I do. I admire all kinds of work, but personally, I’m not interested in making really aggressive or shocking things or expressing anger. Typically you hear about artists expressing themselves, having a voice. Instead of expressing my inner dramas, anxiety, fears, anger, I want to put out into the universe what I feel is lacking, what I am lacking. That feeling of surrendering, that calm, serene experience that I have at ruins, I try to find in my work. GILDED BIRDS Did your love of ruins contribute to your response to the call for a 9/11 memorial and the way you worked on Tribute in Light? GUSTAVO BONEVARDI I rode my bike to “ground zero,” as it wasn’t yet called, the night of September 12th and took some pictures. I felt compelled. The ruins and fragments that remained standing after the towers fell were incredibly powerful, overwhelming really, but they were a product of violence, and hatred. 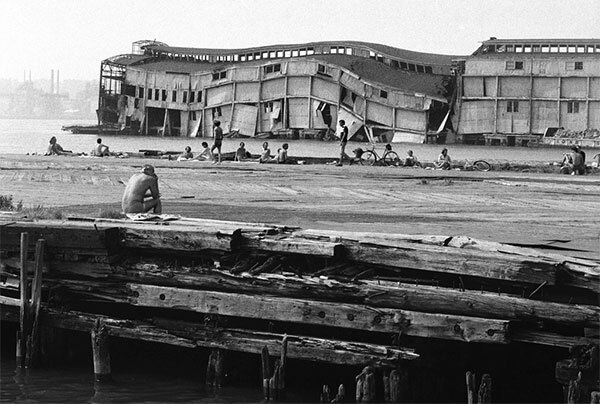 The ruins that I love, like Pier 48, are the result of a gentle surrender to nature. It’s very different. The memorial lights are ephemeral, delicate, healing, nurturing. I guess it’s what I look for with my drawings, with all my art. GILDED BIRDS Do you think if you lived in the middle of a very peaceful mountain range you might make shocking, outrageous art? GUSTAVO BONEVARDI I doubt it, but it’s an interesting question. It’s true that the art I love lifts me away from my immediate surroundings and situation. It’s a refuge, an intimate experience. The pier had the same effect on me. Although you ran the risk of something falling on you and you could never be certain of the intentions of some random stranger you might encounter, I felt in some way safe. There was also something else too, an intimacy with the structure and the river. It was so quiet. I think that in a way ruins can remind us that collapse is not all bad. At times it seems the world is collapsing. Perhaps there are wonderful things about that. GILDED BIRDS So do you mind the process of aging and turning into a ruin yourself? GUSTAVO BONEVARDI Well that, I feel a little differently about! I’m holding up fairly well so far but I know it’s a matter of time. Maybe I could learn a lesson from my love of ruins, finding beauty in imperfection, not longing for how things once were but instead for the way they are. I don’t see it that way yet though! GILDED BIRDS What makes something worthy of the word Beauty to you?